Dancing Eggs from Haba is a fun game in which ages 5 and up 2-4 players jump, run, dance and more all while holding eggs in strange spots. The idea is you roll the dice and whatever it lands on you have to do, you might end up with a egg between your knees, neck, elbows and more. My kids really enjoy this game they play it often by themselves, I try to join in sometimes but they are just having to much fun. An exhilarating bouncing action game that fosters hand-eye coordination and fine motor skills. One of HABA's most popular games, this is a winner of the Major Fun Keeper Award, and the National Parenting Publications NAPPA Honors Award! 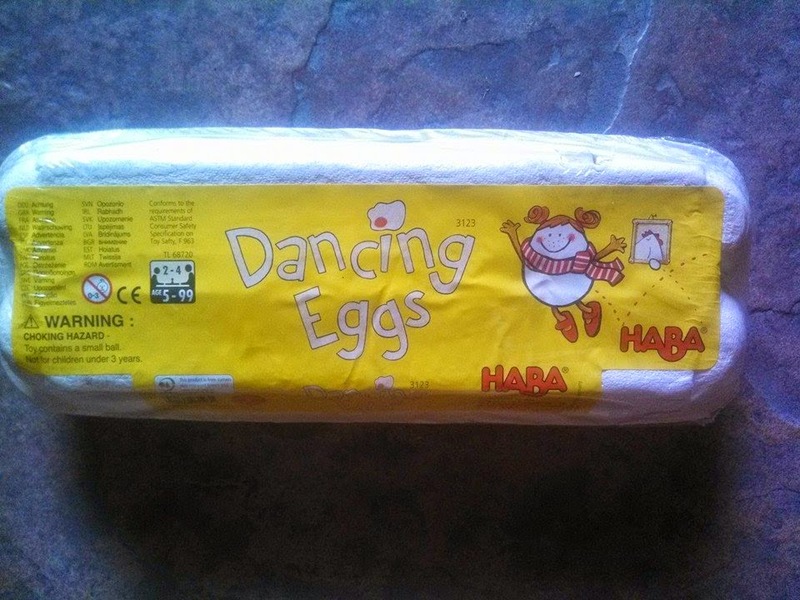 Kids and parents will enjoy playing Dancing Eggs by HABA! Caught the dancing egg? Great, now run around the table with the egg under your armpit or between your knees. As soon as an egg drops, the game is over... and don't forget about the egg thieves! You can purchase this fun game by clicking here or on Amazon.